Property 5: Want to ESCAPE and RELAX by the sea? Property 7: Light, bright apartment 2 minutes from beach. Property 10: Salty Sand & Pepper !!! 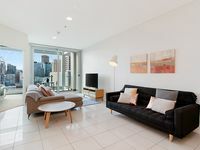 Property 28: ACAILL ACCOMMODATION - Esplanade Living! Property 29: Stylish and comfortable, views over Gouger St! Property 40: "Beachside at the Bay"
Property 47: ACUSHLA ACCOMMODATION - Esplanade Living!